Mallinckrodt plc (NYSE: MNK), a leading specialty pharmaceutical company, today announced the inaugural recipient of its Advancing Extracorporeal Photopheresis (ECP) Immunomodulation Investigator Award. The winning entry was submitted by investigator Dr. Nick Matthews and co-investigator Dr. Arun Alfred of the Department of Haematology at Rotherham NHS Foundation Trust in the United Kingdom. Their proposal seeks to establish whether immunomodulation achieved through extracorporeal photopheresis (ECP) used in treatment of chronic graft-versus-host disease (GVHD) occurs through mediation of in vivo macrophage activation. Along with the 2018 Investigator Award, the Department of Haematology at Rotherham NHS Foundation Trust will receive an educational grant of €50,000 to support this research. The winner was first revealed at the THERAKOS ECP Immunomodulation™ symposium at the 44th Annual Meeting of the European Society for Blood and Marrow Transplantation (EBMT) in Lisbon, Portugal. 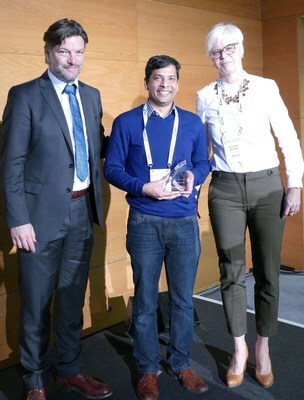 Receiving the award at EBMT 2018, on behalf of the Rotherham NHS Foundation Trust, Dr. Alfred said: "It's an honour to receive the inaugural Investigator Award and we look forward to sharing the outcomes of our work in due course." Mallinckrodt developed the Investigator Award to mark 30 years of its pioneering THERAKOS ECP Immunomodulation™ and it reflects the company's ongoing commitment to the science of immunomodulation through ECP and its therapeutic applications. The award recognises individuals and institutions whose remarkable research contributes to the advancement of knowledge in this area of medicine. "Mallinckrodt is a pioneer in ECP immunomodulation and we recently celebrated the 30th�anniversary of THERAKOS," said�Steve Romano, M.D., Executive Vice President and Chief Scientific Officer of Mallinckrodt. "We are proud to support the work of those who continue to push boundaries in the field and I congratulate Dr. Alfred and his team at the Rotherham NHS Foundation Trust on this recognition." Entries were invited from clinicians and scientists working on translational or outcomes-based research, as well as collaborative projects. Submissions were assessed on a range of criteria, specifically scientific merit, novelty and feasibility. The 2019 Advancing ECP Immunomodulation Investigator Award will be open for entries from September 2018. Full details on how to enter can be found at www.therakos.co.uk. Mallinckrodt is the world's only provider of approved, fully-integrated systems for administering immunomodulatory therapy through ECP. Its Therakos therapeutic platforms, including the latest generation THERAKOS� CELLEX� Photopheresis System, are used by academic medical centres, hospitals, and treatment centres in more than 30 countries and have delivered more than 1 million treatments globally. For more information, please visit�www.therakos.co.uk. Mallinckrodt is a global business that develops, manufactures, markets and distributes specialty pharmaceutical products and therapies. Areas of focus include autoimmune and rare diseases in specialty areas like neurology, rheumatology, nephrology, pulmonology and ophthalmology; immunotherapy and neonatal respiratory critical care therapies; analgesics and gastrointestinal products. The company's core strengths include the acquisition and management of highly regulated raw materials and specialized chemistry, formulation and manufacturing capabilities. The company's Specialty Brands segment includes branded medicines and its Specialty Generics segment includes specialty generic drugs, active pharmaceutical ingredients and external manufacturing. To learn more about Mallinckrodt, visit www.mallinckrodt.com. Mallinckrodt uses its website as a channel of distribution of important company information, such as press releases, investor presentations and other financial information. It also uses its website to expedite public access to time-critical information regarding the company in advance of or in lieu of distributing a press release or a filing with the U.S. Securities and Exchange Commission (SEC) disclosing the same information. Therefore, investors should look to the Investor Relations page of the website for important and time-critical information. Visitors to the website can also register to receive automatic e-mail and other notifications alerting them when new information is made available on the Investor Relations page of the website.